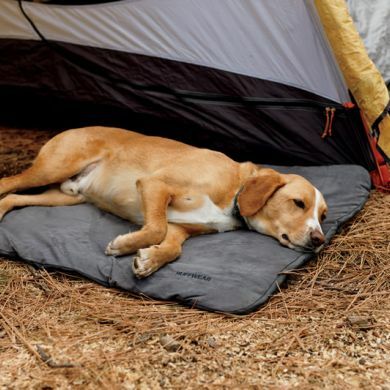 Whether you're driving in the car, relaxing at home, adventuring on a camping trip, or on other travels, your dog will have a cozy place to snooze on the Ruff Wear Mt. Bachelor Pad. 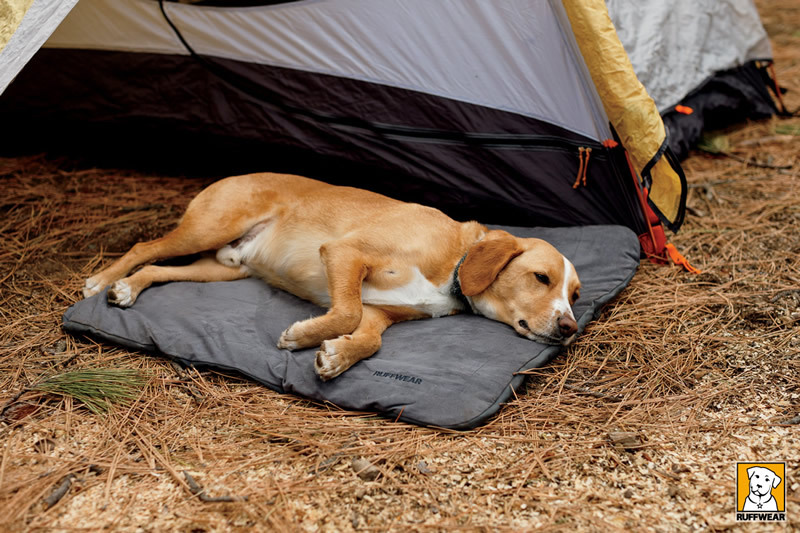 This low-profile, portable bedroll gives dogs a sense of home in different environments. 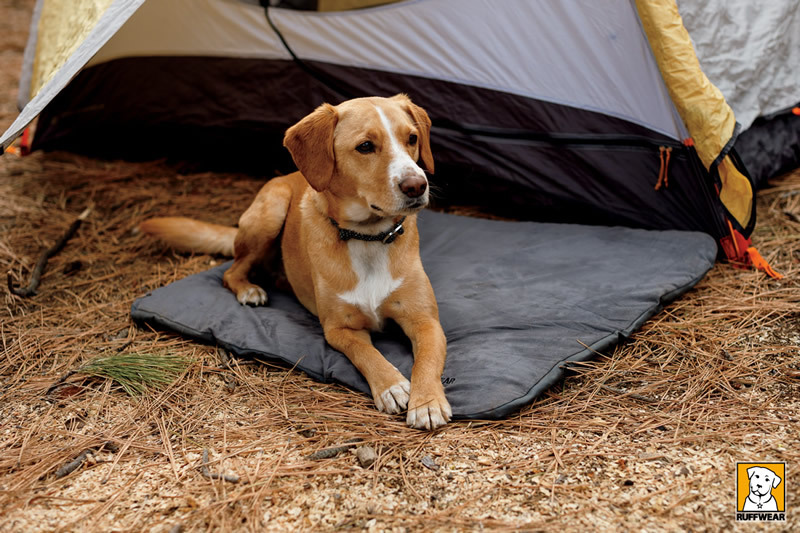 Easy-to-clean, the Mt Bachelor Pad dog bed covers and protects surfaces from dirt and dog hair. It rolls up and secures with integrated hook and loop straps for easy portability on-the-go!. The Waggle pack loves this bed. We use it every day to protect the back seat of our car. 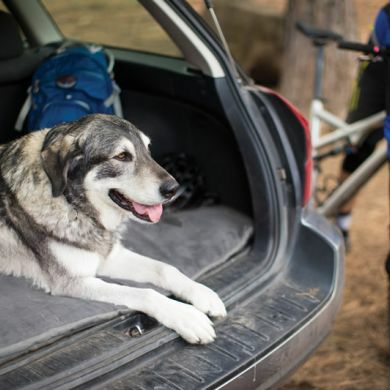 When Pluto bounds in onto the seat covered in mud from the dog park, only the Mt Bachelor pad gets dirty. We just toss it into the washing machine when it's looking a bit dirty and hang it out to dry. 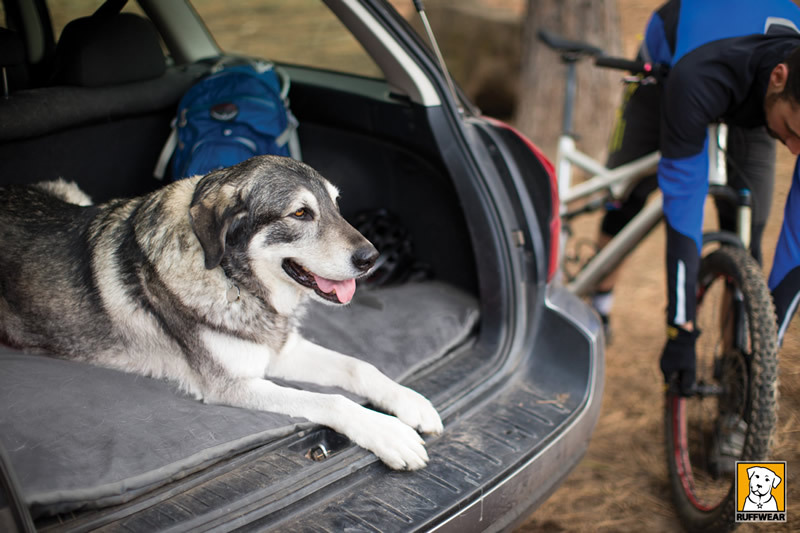 With the Mt Bachelor Pad in the car, we always have a comfy spot for Pluto if we find ourselves at a dog friendly cafe or visiting a friend. Machine washable, hang to dry for easy care. 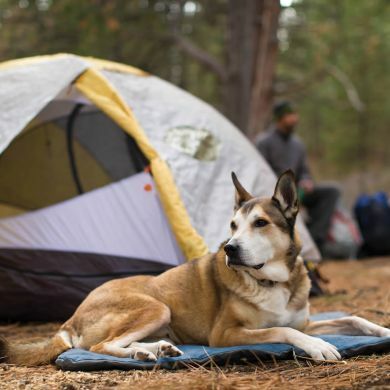 Read 6 customer reviews of Ruffwear Mt Bachelor Pad. The average customer rating is 5. Wolfgang loves his new Pad. 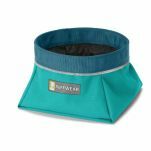 Space is an issue so it's really handy to keep it rolled up when he doesn't need it but then open it up and lay it down on the floor or lounge when it's time for a snooze or just chill! He doesn't mind sharing it with the other dogs but isn't keen when the cats move in. 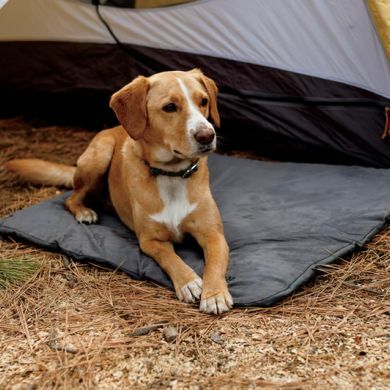 I'm Spudrick, a Canine-Assistant Therapist and I LOVE my Mt Bachelor Pad! I take it with me wherever I go because it rolls up into a little light-weight swag with a handle and it's easy for my mum to carry or put in her hand bag. It is so soft and comfortable that I can stretch out and fall asleep on it, even though I'm supposed to be working. I'm never cold or wet, because it's waterproof, so I can even be outside in a courtyard, under a table at a café, on slippery, muddy wet grass, or even in the icy cold snow in the winter time...and sleep with my bear, who also keeps nice, snuggly and warm. The Mt Bachelor Pad is awesome inside too, because it's much softer than sleeping directly on concrete, floorboards, tiles or carpet. Mum likes the colour too, because it doesn't show the dirt, and if it does need a wash, it's really each for her to clean. This is a perfect product for me and my bear. and since i will training him for life its a great investment. Others in the class have asked me where i got it from. when where not training its in front of the heater for him to sleep on. I bought this doggy swag for our new pup going on his first camp out. I got one years ago for our other dog and due to the fact it has lasted so well and she loves it I thought Lewis would like one too. 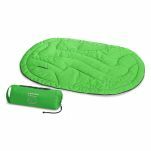 Well he loved it and the new model is great with the outer cover slightly "rubberized" it doesn't slip and slide on hard surfaces. 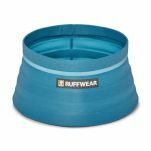 Totally recommend this for those dogs who don't fuss over beds just want something to keep out the cold and give a comfy place to sleep. I chose this item as it rolls up (like a swag). I have a hatchback car and a standard poodle. So it's either kids in the back seat or Milo in the whole back. 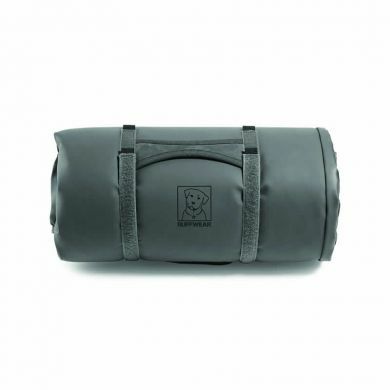 I needed a waterproof (mudproof) mat for Milo to land on after dog class but something that I could roll up quickly and change the seats back for the kids. This is perfect. 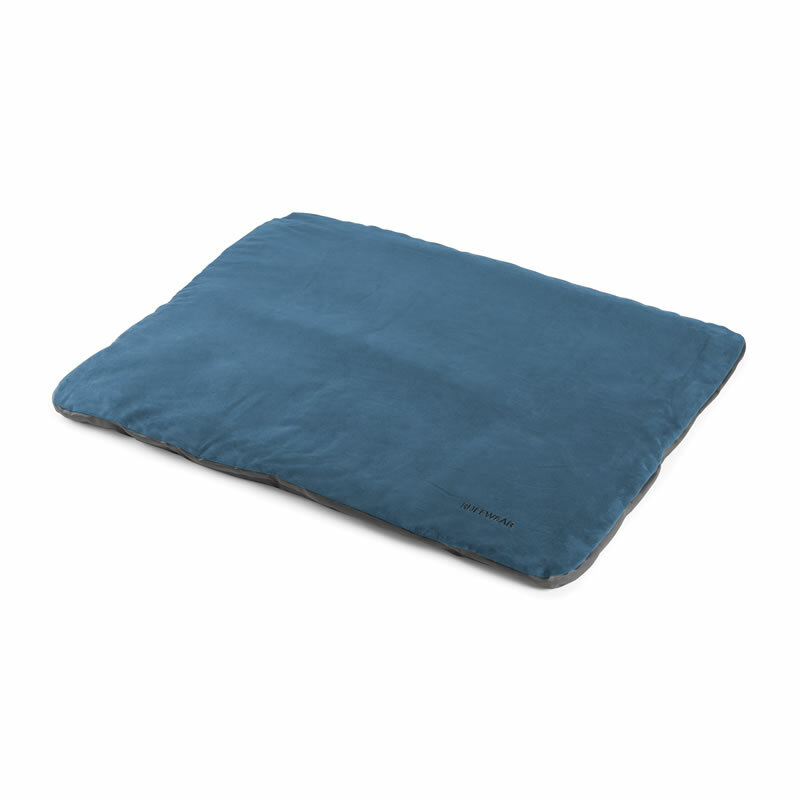 We have 3 of these and they are absolutely the best dog bed on the market. They are easy to wash in the washing machine, roll up well (and stay rolled up) and are damp proof on the underside. I 'lost' one in the backyard - it was out in the elements for months, but it just washed up and is as good as the other two.